In recent decades the concept of kinship has been challenged and reinvigorated by the so-called "repatriation of anthropology" and by the influence of feminist studies, queer studies, adoption studies, and science and technology studies. These interdisciplinary approaches have been further developed by increases in infertility, reproductive travel, and the emergence of critical movements among transnational adoptees, all of which have served to question how kinship is now practiced. 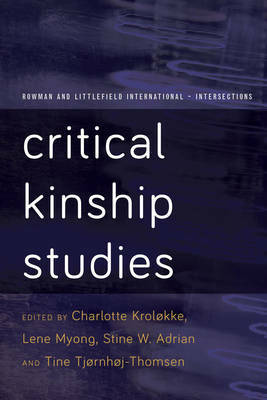 Critical Kinship Studies brings together theoretical and disciplinary perspectives and analytically sensitive perspectives aiming to explore the manifold versions of kinship and the ways in which kinship norms are enforced or challenged. The Rowman and Littlefield International - Intersections series presents an overview of the latest research and emerging trends in some of the most dynamic areas of research in the Humanities and Social Sciences today. Critical Kinship Studies should be of particular interest to students and scholars in Anthropology, Sociology, Cultural Studies, Medical Humanities, Politics, Gender and Queer Studies and Globalization.